One of the major criticisms of credit scoring is the alleged link between a person's race and poor credit score. On the surface, the credit score does not know a person's race as it is just based on a set of behavioral indicators (do you pay your bills on time and things like that) which depending on whom you believe might suggest credit scores are a proxy for membership in racial and ethnic groups. The FTC's recent report (see p 4) says there might be some relatively small relationship while other studies do not find it (see III's list of industry funded, but scientifically not objectionable studies). Given this background, I'd like to pose another question. 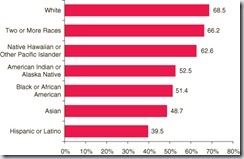 Let's suppose that a certain racial group has a higher percentage of people with a propensity to do X. [Let's let X be undefined for a moment and let it be under a person's control and not be something like a gene which causes a higher risk of disease or death.] So, should public policy prohibit the use of race merely because of a disparate impact? Under the Civil Rights Acts (which do not apply to insurance coverage), the prima facie disparate impact test would be something like: if the decision to insure is facially neutral to one's race, but there is higher proportion or statistical adverse impact based on race, then there is evidence of discrimination. Again, this is not the rule as applied to insurance underwriting decisions, but just in case it was, it would be theoretically possible to void credit scoring if one could show a link between race and low scores. Now suppose that an insurer desired to charge people who smoked a higher rate than non-smokers. Could one argue based on the disparate impact theory that if relatively more smokers were of race Z, then then there would be a disparate impact on people of race Z and that would be enough to prohibit the risk classification? The insurance market provides incentives to high risk people to modify their behavior. If people have poor credit scores their cost of risk is higher. Won't this knowledge lead people to make better decisions about their financial health leading to a lower cost of risk in the future?